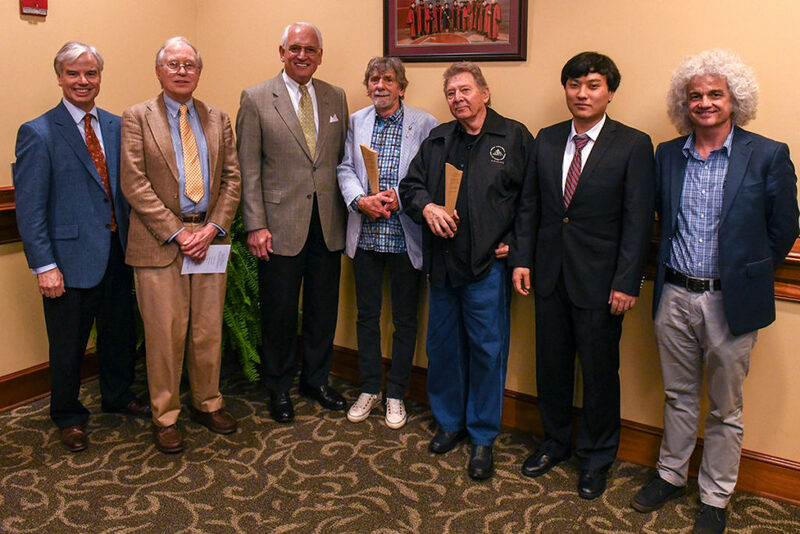 Troy University has honored a pair of celebrated songwriters who helped shape the soul, pop and rock music of the ‘60s and ‘70s with the Hall-Waters Prize for Excellence in Southern Writing. Dan Penn and Spooner Oldham are legendary figures in the Muscle Shoals music scene who have written and performed on some of the most iconic pop songs in history. They are the first songwriters to be honored with the Hall-Waters Prize, and the duo accepted the award during a ceremony on Friday, April 12, at the Troy Campus. They said it was an unexpected honor to receive an award whose past recipients included celebrated novelists and poets. Penn said the award was a great honor. Presented annually by TROY’s Department of English, the Hall-Waters Prize honors people who have made significant contributions to Southern heritage and culture in history, literature or the arts. Although many of its past recipient have been authors, Dr. Kirk Curnutt, chair of the Department of English, said it was a logical choice to honor celebrated songwriters Penn and Oldham. Spooner Oldham and Dan Penn, center, holding the Hall-Waters Prize trophies. From left to right: Walter Givhan, Senior Vice Chancellor for Advancement and Economic Development, Greg Swem, Chancellor Dr. Jack Hawkins, Jr., Oldham, Penn, Hao Yin and Dr. Kirk Curnutt. Penn was still a teenager when a demo recorded with his band, Benny Cagle and the Rhythm Swingsters, called “Is a Bluebird Blue?” caught the ear of Conway Twitty, who made it a hit in 1959. At 20, he became the first in-house songwriter at FAME Studios (short for Florence Alabama Musical Enterprises) in the Shoals, working closely with founder Rick Hall. After relocating to Los Angeles, Oldham backed artists as diverse as Linda Ronstadt, Jackson Browne, Neil Young and Bob Dylan. Since coming back to Alabama, he has worked with Bettye Levette, the Drive-By Truckers, and many more. Before accepting the award, Penn and Oldham shared stories and discussed and the craft of songwriting with students in the John M. Long School of Music. On Saturday, April 13, they will speak at the Alabama Book Festival, in Montgomery, before performing a concert that evening featuring the numerous hits they wrote for Janis Joplin, the Box Tops, and Aretha Franklin. The Hall-Waters Prize was endowed by TROY alumnus Dr. Wade Hall, an author, former member of the faculty at the University of Florida and professor emeritus of English at Bellarmine University in Louisville, KY. Past winners include Rep. John Lewis, Bobbie Ann Mason, Pat Conroy, Natasha Trethewey, Cassandra King, and Ace Atkins, among others.